Temporary Edge Protection System for Excavations and Cofferdams. into excavations of light debris or persons. Steel Mesh Barrier with inbuilt Toe-Board. The Adjustable Clamp adjusts to sheet pile wall thickness with a housing where the most inserts over which the barrier is attached. The installer uses only a hammer to erect this system. Installed at maximum 2.4 metre spacings, barriers overlap anywhere along their length which means that clamp positions are not critical and that the J-SAFE system can be adapted to any plan shape and size. An entire safe access and egress system is possible when designed using J-SAFE pedestrian gates and Site Stairs into the excavation. A full design can be prepared by the J-SAFE Technical team to optimise the economies of the system. 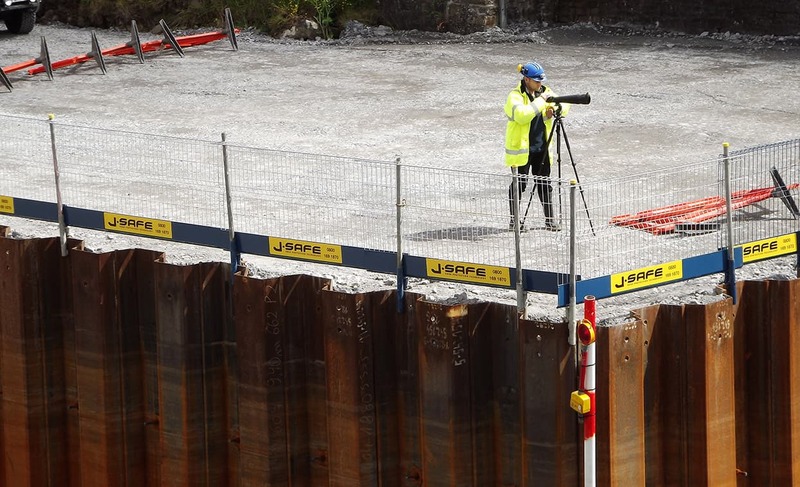 Alternatively for applications where the adjustable clamp for trench sheets or sheet piles is impractical, the J-SAFE Freestanding systems could be suitable for arranging around the perimeter of the excavation.